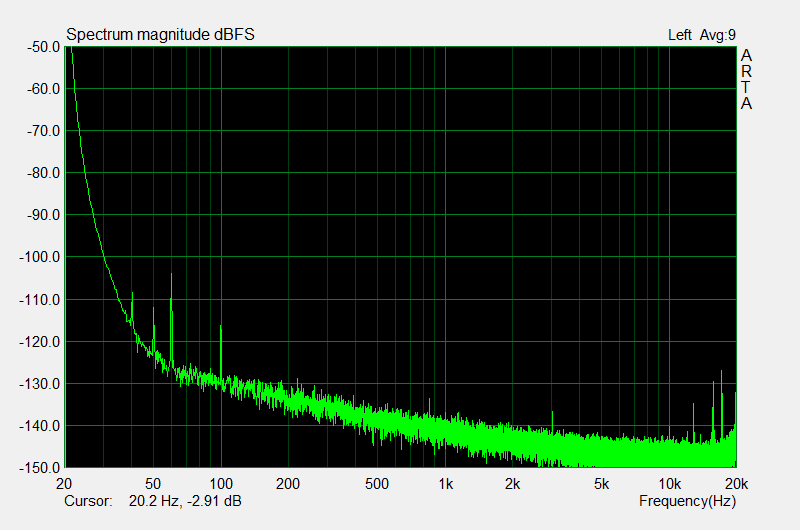 In my first review of the LJM CS4398 eBay DAC, I used a Xonar DX to do mainly RMAA measurements. Well, some thing happened the week before this, and also now I have an STX, so I want to do some new measurements, measurements that are not RMAA and can be used for comparison against others. Linearity Error -90dBFS 24/44 0.1dB A? If you think that I'm trying to make a point by intentionally presenting the data in this format, you're right. I've made it so that you can compare against NwAvGuy's measurements of ODAC as much as possible. Some of the numbers cannot be done by ARTA, so I've substituted them with graphs and RMAA when possible. Maximum output line out and Noise dBu are still missing, but if enough people show me that they care, I'll find them out for ya. THD+N 100Hz 0dBFS: I'd like to first apologize for a whole bunch of previous measurements, because I have forgotten to make sure that the output level in ARTA is 0dBFS, and when I checked before today's measurements, it wasn't. It was evident that I have used -1dBFS in my previous measurement of LJM CS4398, because it cannot do 0dBFS cleanly when I measured it today. 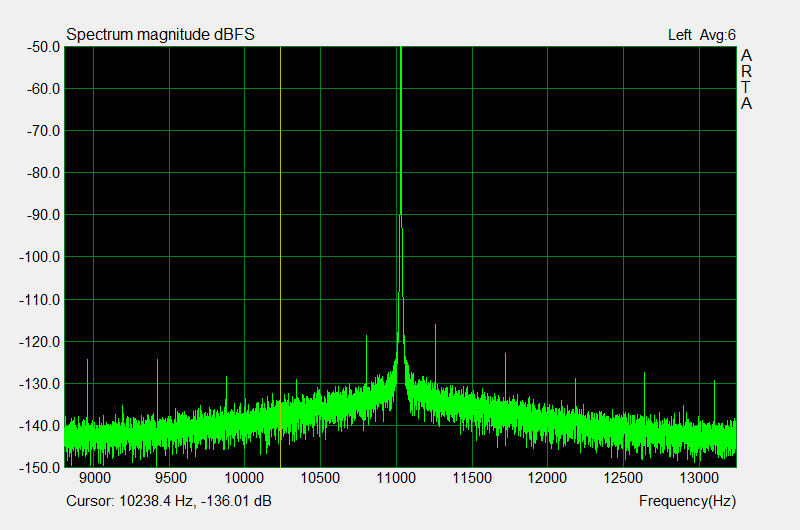 Basically the LJM CS4398 distorts rather hard at 0dBFS across all frequencies, and performs well again at -0.1dBFS. I'm not really sure of the reason why, for the recorded sine wave looks nice enough to rule out clipping. The peaks are symmetrical about the signal frequency and close to the signal frequency so they're not harmonic distortions anyway. Probably something happening in the digital signal processing realm which I don't get (as in understand). Update: I just discovered that the noise at 0dBFS is due to ARTA. Evidence - even when recording from WAVE I get the same problem, proving that this is totally a software issue. The DAC is not at fault. 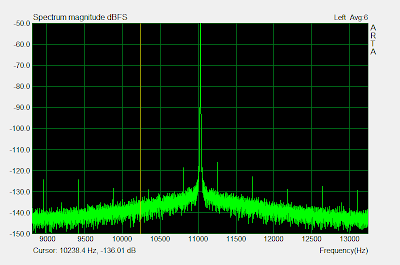 So for now, I'll be doing future measurements at -0.2dBFS. 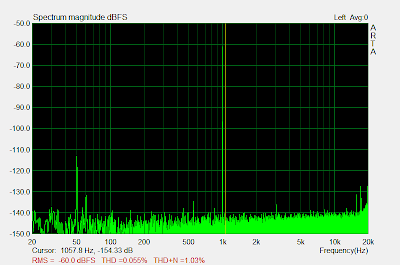 THD+N 20Hz -1dBFS: I decided to not post the numbers according to ARTA, because the frequency resolution is not high enough at low frequencies so I'm suspecting some issues with the THD+N calculation due to huge noise amounts that is thought to exist because the program is unable to see things "sharply" enough at low frequencies. So see the graph instead. The highest peak, the 3rd harmonic, is below -100dB, which when I last checked is good performance. If you want numbers, I remember it being 0.001x% for THD and 0.005x% for THD+N, so something is definitely wrong with the noise calculation because the graph is mostly noise-free. So it's either the 10k~20k region, or the curve at low frequencies, neither of which is the DAC's fault. IMD SMPTE -1dBFS: Quite frankly, I don't know how IMD is calculated. But visually, shits are low and people are happy. 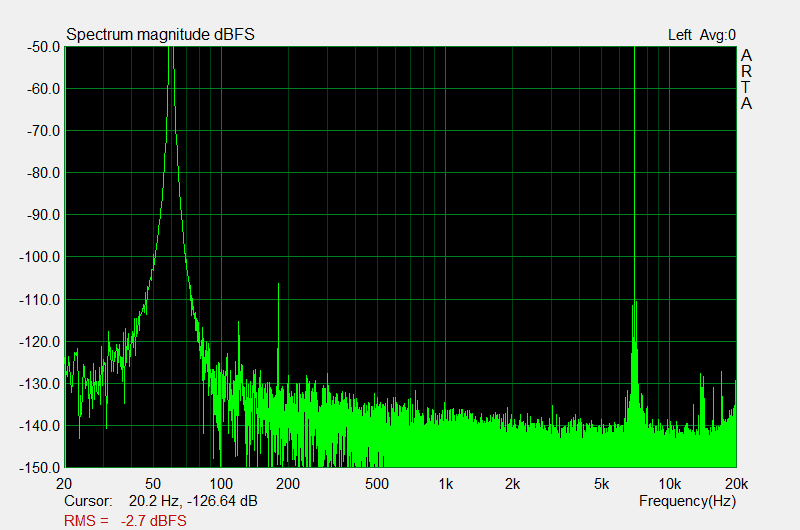 Otherwise, the noise level is low to start with so DNR is nice too. Jitter: Remember that when you measure something, you are measuring the entire measuring equipment chain. So what I'm measuring here is USB -> Musiland Monitor 01 USD -> SPDIF -> LJM CS4398. The best part is - LJM CS4398 uses only a CS8416 and nothing else for the digital side (unless you count the DAC chip), and the DAC's external/internal connectors are not 75Ω.